Birthday: April 4 Bloodtype: B Honoka Yukishiro (雪城ほのか, Yukishiro Honoka, Hannah Whitehouse in English version) is the quiet and reserved one, but that does not keep her from having her own friends and following. She can be quite strict and evil when the situation calls for it. 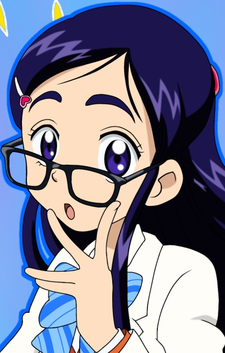 Her alter ego is Cure White (キュア・ホワイト, Kyua Howaito). Her specialty is the science club, where she is looked up to by the others. Honoka hasn't had many friends, but the few she has seem to be really close to her. It has also been noted that she's relatively popular with the boys, though she seems to have little interest in them. She has a love and friendship bond with Kiriya during the first season, and realized it in the second season. She lives with her grandmother and their dog, Chuutaro. Her parents are art dealers and spend most of their time overseas. They return once a year for Honoka's birthday. Despite their prolonged absences, they seem to have a good relationship with their daughter.